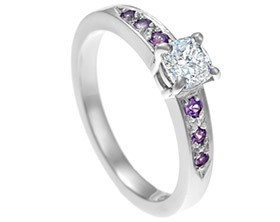 A striking combination of white diamond and purple sapphires. 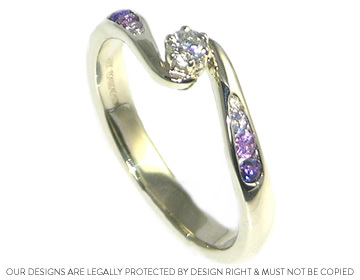 This delicate twist style engagement ring holds3mm 0.10ct brilliant cut H SI diamond at its center in a traditional 6 claw setting.In its shoulders, garduating in size and colour are white diamonds, lilac and then purple sapphires in a channel setting.The 9ct white gold band has been left unplated and polished to a high shine. 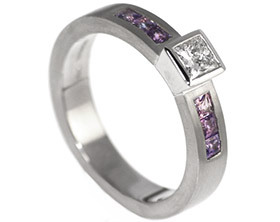 Palladium diamond and lilacsapphire engagement ring. 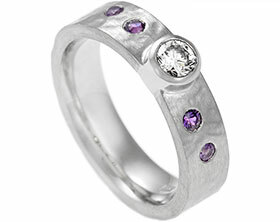 Platinum engagement ring with diamond and three amethysts. 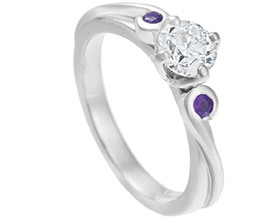 18ct white gold Celtic inspired engagement ring with oval cut 0.57cts lilac sapphire and two brilliant cut diamonds.